There have been many movies about high school outsiders that teach us that once you get to know that slightly odd kid you might just find that they actually aren’t all that different to you. But you can depend on Stephen King to borrow that much used set up in order to give us a slightly different moral: If you know someone who is a little bit weird, they are probably even weirder than you thought. Twenty-seven years since Carrie first hit our screens she is back in a remake that unfortunately doesn’t do much more than repeat the previous film and offers precious little new insight. This time around it is Chloë Grace Moretz who plays the downtrodden teenage girl, Carrie. Victim of an oppressive home environment under her extremist Christian mother and a source of ridicule at her school, Carrie also happens to have telekinetic powers. When she is finally pushed to breaking point the result is a prom night no one will ever forget. MGM is promoting this film as a re-imagining of Stephen King’s novel, but it really feels like a direct remake of Brian DePalma’s 1976 film. There are a number of scenes and giant slabs of dialogue which are exactly the same. There doesn’t appear to be much re-imagining going on at all. Director Kimberly Peirce is best known for her 1999 film Boys Don’t Cry for which Hillary Swank won an Oscar playing a young gay girl pretending to be a man. 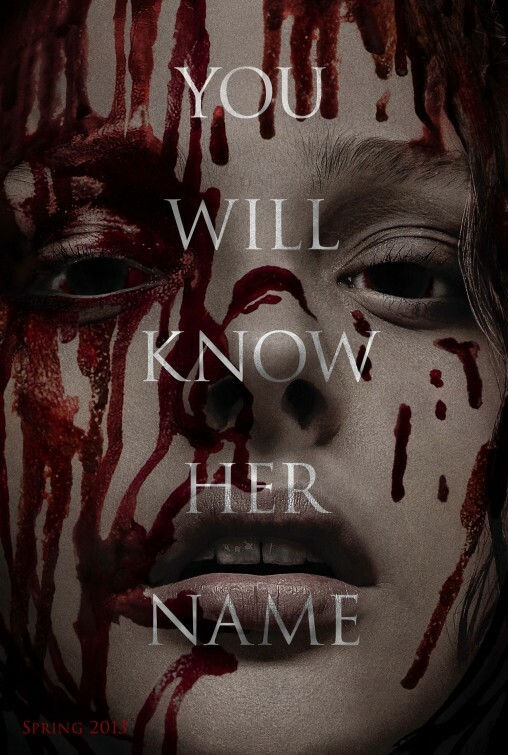 Given the success with which that film explored the struggles of a young woman who felt like an outsider and a freak, there was hope that Peirce might bring some new insight to the thematically similar Carrie. So it is disappointing that those hopes were unfounded, with this new version of Carrie failing to venture anywhere new or explore anything different. Many of the changes from the original version to this one are largely superficial – for example Carrie uses her telekinesis to break a water cooler in the principal’s office rather than an ash tray, she breaks a mirror at school rather than at home – one update which is notable is the acknowledgement of the role that technology and social media now play in schoolyard bullying. Carrie’s initial breakdown, the event which starts the films plot in motion, is captured on a camera phone and posted online. While DePalma’s film was quite tonally uneven, seeming to swing between horror and John Hughes-esque high school drama, Peirce’s take on the story is a straight teen horror. Some of the characters are a bit overbearing in their lack of subtlety – see teen queen bee Chris Hargensen who is as two-dimensional an evil villain as you will find in any fairy tale – but Carrie’s lack of subtlety is most apparent in its use of special effects. Peirce is not a director who is well practiced at shooting effects heavy scenes and this film seems to indulge too heavily in them. Nowhere is this more apparent than in the film’s key set piece, Carrie’s explosion at the prom. In DePalma’s film, despite its impact it was a surprisingly short scene – only about five minutes. This time around it is stretched out to a substantially longer scene – a good 15-20 minutes – without really achieving anything additional in this extra time. Chloë Grace Moretz is one of the very best young actresses going around at the moment, and she is quite good in this. However, she is a stunning young woman and dressing her down in daggy clothes, frizzing up her hair and getting her to hunch over doesn’t even half disguise that fact. Despite her incredible talent, she doesn’t have the awkward, other-wordly quality that Sissy Spacek brought to the original film which earned her an Oscar nomination. Were this the first screen adaptation of Carrie it might not be treated so harshly. It is a perfectly acceptable piece of teen horror. But unfortunately this is not the first adaptation and as such it feels completely unnecessary.